We take the bus from Florianopolis towards Porto Alegre at 11 pm. The plan is to go to Punta del Este in Uruguay and then take a ferry to Buenos Aires. Once in Porto Alegre, however, we find out that all buses heading to Uruguay are fully booked until January. So we decide to stay one night in Porto Alegre. We book the Eco Hostel in the district of Ciudad Baixa for about 10 euros per person in a 6-bed room. After eating and resting a little bit, we go for a walk in the city. We immediately notice that it is full of homeless people in the streets. The following day we visit the old town, mostly full of shops and people looking for a Christmas gift. In the afternoon, a guy from the hostel kindly offers us a ride to the bus station where we take a bus of 23 hours-journey towards Buenos Aires. At 4 am the bus stops and the policemen tell us to get off. We are probably at the border with Uruguay. They keep shouting in Portuguese very quickly, asking us to hand over the passport. We hesitate but then we notice that all the passengers do the same so we do as they order. After a queue of an hour to have back our passports, we go back to the bus and we notice that many people are missing. Some passengers warn the driver that there are bags belonging to people left on the ground, but he continues without hesitation. Around 6 am we do again the same procedure to cross the Argentine border. After this stop, the driver announces that the next stop will be in 300 km. At 11 am we finally can eat something. We arrive in Buenos Aires at 3 pm, after an exhausting journey. Here a friend of Sonia, Juan, is waiting for us. He has kindly offered to leave us his apartment while on holiday. It is a really nice flat in the Palermo district, one of the richest in the city. Tomorrow is Christmas Eve...and here is hot! It is so strange to wear shorts at Christmas time. We are used to a snowy atmosphere and hot chocolate in front of the fireplace. But even so, it is not bad at all. Let's go downtown, in Florida street, where it is possible to change euros at a more advantageous (illegal) exchange rate. At each corner there is someone who screams "exchange" with the relative exchange rate that you can try to bargain slightly. After completing the first illegal action in a foreign land, we are moving towards the San Telmo district. It is really cute with its narrow streets and dozens of vintage shops. We immediately fall in love with it! We return home to prepare a delicious Christmas Eve dinner: an appetizer of boiled eggs in a pink sauce and the first (and only) dish of ravioli with butter and sage. On Christmas Day, we walk along the streets of a ghost town. All the shops are closed and people are at home with their families. So we decide to have a picnic with rice and vegetables in the 3 de Febrero Park. Here we enjoy the warm sun and the silence of nature. A rather alternative Christmas day! The following day we go for a walk in the north of Palermo district to visit the cemetery Recoleta, popular for the countless famous figures buried here. At the exit, we stop to visit a local craft market. In the afternoon we visit the nice and relaxing Japanese garden of the city. Then we decide to have asado for dinner, that is all kind of meat roasted in front of you, combined with mashed potatoes and pumpkin. Really delicious! Late in the evening, we meet our friends from Florianopolis: Robi and Leo. With them, we go to a place known as "the red door", full of local people, with a very nice atmosphere and where it is easy to make friends. We leave the bar looking for a disco but in the end we spend the night chatting and laughing on the streets. They take us for a tour of the city by night and we stop to admire the Bridge of the Woman (Puente de la Mujer) in Porto Madera. It is a work of the famous Spanish architect Santiago Calatrava located in a modern area full of skyscrapers. We stay here until we see an amazing sunrise. We return home around 6 am, tired but extremely happy and satisfied. The following day we go back to the district of San Telmo because there is a Sunday antique market that is really worth visiting. We then move on to one of the most famous neighbourhoods in Buenos Aires: La Boca. It is full of restaurants, tango clubs and many street artists. But it is popular for the famous Caminito known for its colourful wooden buildings, inspired by the original homes of the immigrants of this area: Italians and specifically Genoese. Despite being a very tourist district, it is easy to let yourself get carried away by the music and the bright colours of these streets. 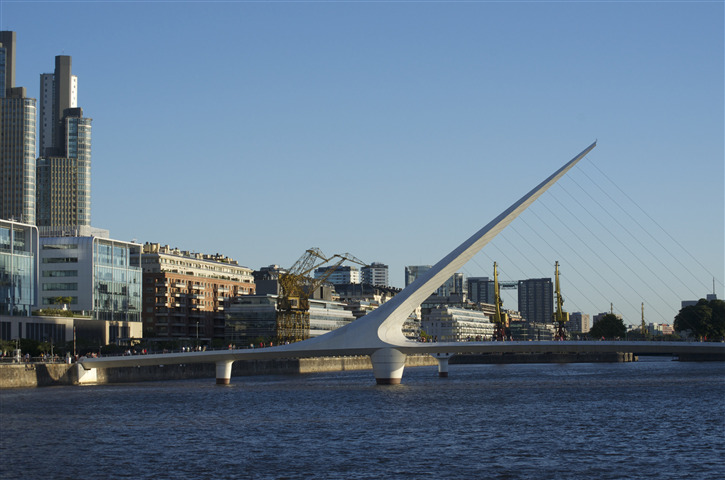 Buenos Aires is certainly a fascinating city, a mixture of South America and Europe, with dozens of different cultures. People are really hospitable and kind, especially when they know that we are Italian. Probably because almost everyone has Italian relatives emigrated to Argentina and many of them dream of going to Italy but do not have enough money. It is a city however full of controversy, as indeed almost all the South American countries. On the way to the airport, we talk for a long time with a local gentleman who tells us about the neighbourhoods called Villas. He says they are the equivalent of Brazilian favelas but they are not built at the foot of the mountain. Instead, they form entire suburbs of the city and are inhabited for 20% by workers and 80% by criminals. They are comfortable living here because they do not have to pay any kind of taxes to the state. And the police do not do anything because it's corrupt. There are too big drug dealings behind it and they can only benefit from them. Then there are neighbourhoods such as the one in the north of the city, near Tigre, where the richer drug dealers live and where access to foreigners is forbidden. According to him, the young people have now entered into a too risky drug deal and they will be able to exit from it only after death. It is a rather sad scenario the one described by this man. A truth easy to hide from tourists, but hard to swallow for the good and honest people who live in this beautiful country.